Analyse comings and goings, by foot and by car. You’ll also need to assess whether it’s primarily for security (keeping people and animals in or out) and/or privacy. This practical wishlist will form the basis for your brief. It will impact on whether the gates will need to be automated (and if so, in what way, and how they will be controlled), the material they are built out of, whether you need an additional pedestrian access and much more besides. Keeping all this in mind as you begin to make decisions along the way will ensure success. First thoughts should turn to positioning. Your driveway gates will direct cars to a certain part of your plot. Jackie, in line with most landscape designers, spends a lot of her time designing gates and thinks that off the shelf models can work well, but to really complement the house, it is best to have them designed from scratch. 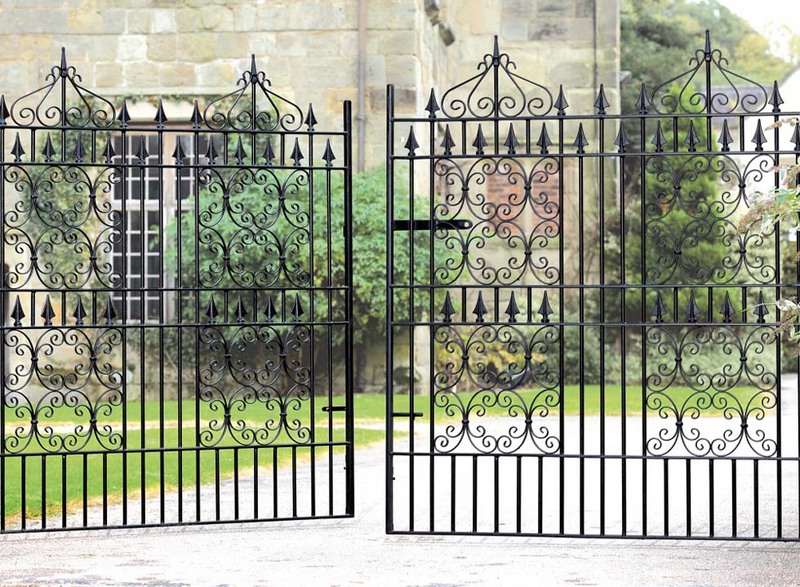 All the major gate suppliers offer a bespoke service — indeed, as so few gate openings are standard sizes, almost all gates are effectively made to order, even if the majority are from standard templates. There are a range of different basic styles and shapes, many of which have gradually lost their meaning over the years. A courtyard gate is essentially a taller (usually 1.8m) driveway gate designed primarily with privacy in mind. Estate gates tend to be grander affairs, originally designed for entrances to large estates but now more commonly used to describe lower, sweeping, swinging gates usually of metal; quite common now on driveways looking for that rural look. 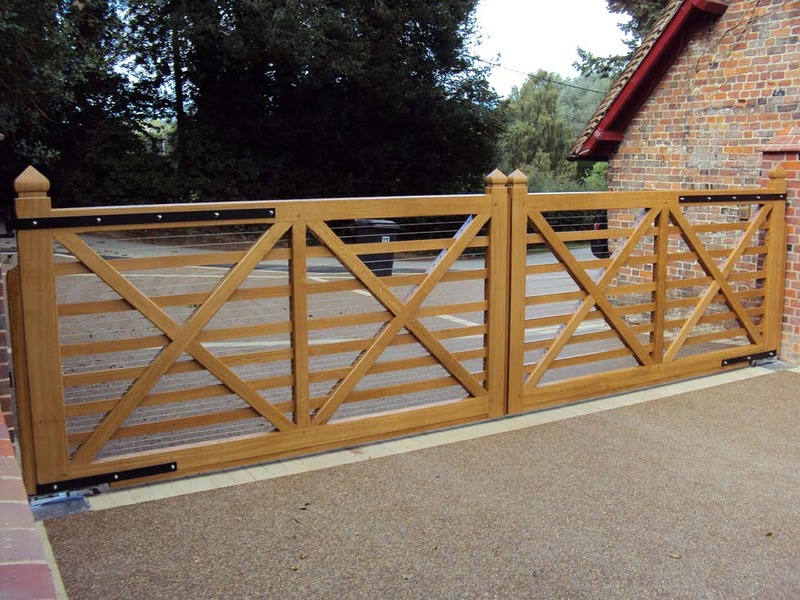 A field gate (based on the traditional five- or six-bar farm gate) is an option for those after lower installations as is its single cousin, the uni gate — ideal for openings of less than 2m. A picket gate (sometimes known as wicket or palisade gates) which consists of closely fixed vertical boards with a top and bottom brace connected by a diagonal or straight middle brace. Every design-based choice also has a practical consideration, and vice versa. 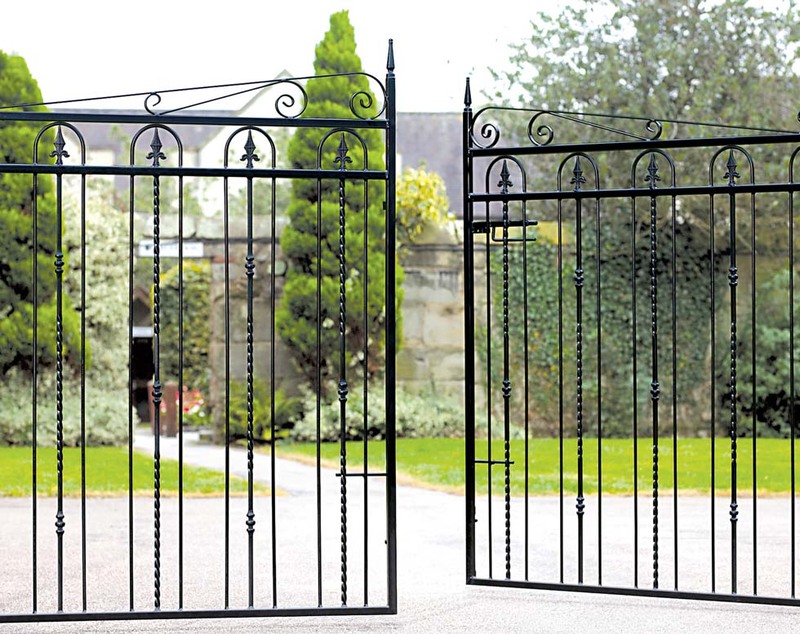 Metal gates can look grand but they suffer when it comes to ensuring privacy. Wooden gates have a flexibility of offerings (close-boarded courtyard gates offer privacy while field gates tend to struggle to keep dogs in) but do need regular maintenance to avoid twisting and warping. Key design points to look for on wooden gates include the position, style and number of braces, as well as the number of bars. Leave a space for a pedestrian gate, and don’t forget somewhere for post and deliveries. You want your gates to enhance security but you should also be careful about making this their overarching function. Security is important but you want to avoid the look of fortification where possible. Big, imposing gates obviously signpost security, but they also therefore tell potential burglars that there is something worth looking for behind them. So, finally, what’s fashionable? 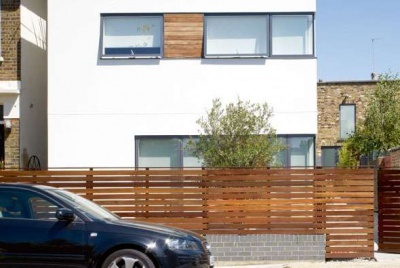 Well, we’re certainly seeing an increase in contemporary, close-boarded, automated gates on top-end modern homes. Some people prefer steel gates as they are robust and require little maintenance, whereas others prefer the look of close-boarded timber gates as they offer a higher degree of privacy. 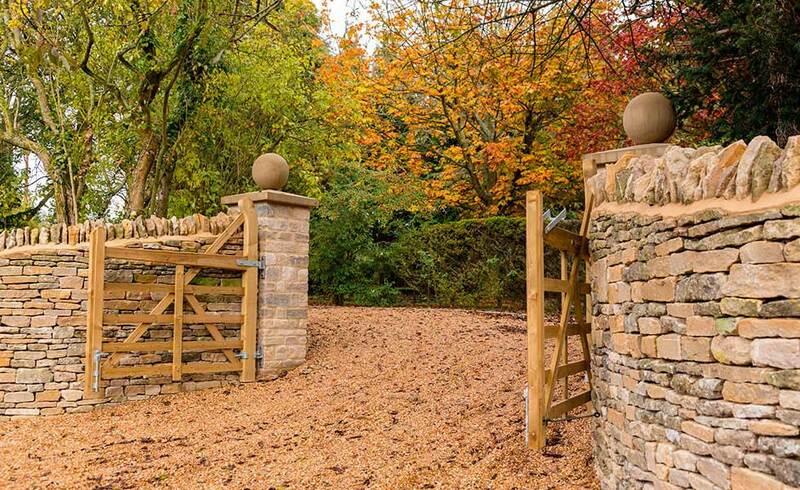 Gates can cost anywhere between £200 for a simple softwood field gate and £3,000+ for a top-of-the range hardwood or iron gate. Automation kits start at around £300, although for most models you should budget £500-1,000, with intercom-style controls another £3-400. With installation on top, you could be spending the best part of £5,000+ on a full bells-and-whistles arrangement. Automating your gates is a sensible option for homeowners who expect to use them regularly or who have little buffer between the gate entrance and highway. It’s undoubtedly more convenient, and arguably improves security, but automation also means a more complex installation with a greater likelihood of failure and, of course, added cost. Swinging kits are obviously designed for a pair of gates — if you want a pair of gates to slide open, you’ll need two kits, which adds significantly to costs. Swinging gates, however, will not be much of an option on sloping driveways. Sliding kits demand at least the same opening to the side as the gate itself. Now for the mechanics. The most common (and cheapest) option is for a swing arm operator (a bit like an automated version of the arms you get on self-closing doors in office buildings), which operates off an electrically powered gear kit situated in a rather incongruous box to the side of the gate itself. The arm itself will be visible either off the top or bottom of the gate itself. The ram version of this sort of kit has a solid ‘ram’ arm that attaches itself flush to the post and bottom bar, so it’s a bit more discreet. Most of these systems can be mechanically or hydraulically operated, which suits heavier gates. 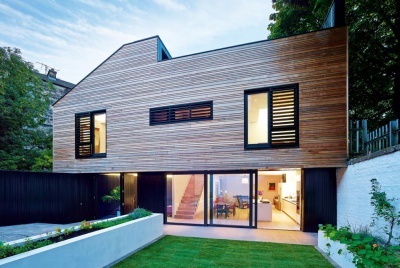 Hidden or below-ground arm systems improve aesthetics but are more complicated to fit, more expensive (usually £200-400 more) and, if not installed correctly, are open to issues with water ingress. With sliding track systems, the benefits and potential problems are simply exacerbated. 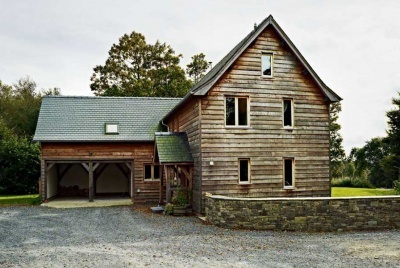 “Problems with automated systems are usually down to bad installation — the positioning of the kit or tracking has to be exact, otherwise the gate is forced into positions it doesn’t want to go,” says Steve Scarle from The Wooden Gate Company. Some systems offer photovoltaic cell powering. Also, remember that gates can often be automated after installation, although doing it all at once saves costs and hassle. What’s the purchase process, and how do I avoid key mistakes at installation? The best thing to do is ask for advice. The installers will visit, ascertain exactly what your requirements are, measure up and then provide a full quotation, including all the posts and fittings they will need. Typical lead-in times are two to three weeks. Regular gates can be installed by competent DIYers, although most suppliers will advise on local installers if required. Automated systems are best left to the suppliers. How do I maintain my wooden gates? The nightmare scenario for the wooden gate owner is the warped gate. The choice of wood will make a difference to long-term stability, but nothing is a fit-and-forget option. If your proposed gate is taller than 1m then you’ll need planning permission if your gate is ‘next to’ a road or footpath. There is a distinct grey area in the definition of ‘next to’ — some local authorities appear to remove the need for permission if there is more than 1m between the gate and footpath/highway; others require 5m; others, including the planning department we spoke to, didn’t seem to be aware of any buffer at all, just insisting on planning permission being required for gates over 1m on the ‘frontage’. There are a raft of appeal decisions on this issue — all of which agree on the lack of a clear definition of ‘adjacent’ and none of which, unhelpfully, come to a unified conclusion as to a safe distance from the highway to be considered Permitted Development. Each gate seems to be judged on its site specifics. If your house is listed, or is subject to an Article 4 Direction, then you will require special consent. If your gate is taller than 2m, you’ll need permission for it regardless of where it sits. Don’t forget to allow for the width of the gate posts. Be wary of filling in the whole gap with large gates that you have to open every time you want to leave on foot. Any gate can be automated, so you should budget at least £500 extra for this service. It’s not the kit so much as the installation that needs close attention to avoid automation problems. Consider postal/parcel deliveries in your design. ‘Friendly security’ is a good aim. Avoid being impenetrable and aggressive and trying to fortify the home. This is a problem for the 6ft close-boarded wooden gate, but it can also be an issue with pointy iron railheads on smaller gates.